All these years later I still have the DVD. Picked up at a garage sale for the bargain price of $0.50, the NRL – 2005 Year In Review remains one of the most cherished items in my rugby league collection. The amount of times I’ve watched that video, from start to finish, would surely have hit triple figures by now. And it never gets old. Quite simply, 2005 was one of the greatest seasons in rugby league history. A turning point for the game, and one which cemented my fandom. Although it is often overlooked, perhaps even forgotten, by a large majority of rugby league fans, 2005 was a truly remarkable year during which a number of events would help shape the game’s future going forward, for the better. It was a year of fascinating fairytales, intrigue and narratives that not even the most creative minds in Hollywood could conjure. While it would be next to impossible to truly capture the feeling of that season in an article, I’ve decided to go ahead anyway and do my best. Without further ado, here’s a few reasons why 2005 ranks among the greatest seasons in the game’s history. Although he didn’t win any player of the year awards, or even play in the finals series, if ever there was a year that Andrew ‘Joey’ Johns ensured his legacy as one of the game’s greatest players it was 2005. After having missed most of 2004 due to an ACL injury, Johns no doubt looked to bounce back in a big way the following year. However, following a disrupted pre-season of off-field controversy for the club, Johns’ Newcastle Knights began their campaign in disastrous fashion, losing their opening 13 matches. It was only five games into the unprecedented losing streak that Johns went down with a broken jaw against the Warriors. However, after a grueling six-week stint at the Academy of Sport in Queensland, Johns would once again show the rugby league world why he was considered one of the game’s greatest players when he turned out for the New South Wales Blues in his return to the State of Origin arena in 2005. Despite not having played in a number of weeks, Johns led his state to victory in a commanding performance which earned him man of the match honours. It was just a sign of what was to come for the remainder of 2005 for the Newcastle maestro, as he not only helped the Knights break their losing streak, but led them to a run of six consecutive wins late in the season. With Johns in the side and back to his best, the Knights became one of the biggest threats in the competition despite sitting in last place on the ladder, adding an element of unpredictability to each round of the competition. The form of the Newcastle captain saw him make a late run toward the Dally M medal, for which he finished as a runner-up to Johnathan Thurston. In hindsight, 2005 was very much a case of ‘out with the old, in with the new’. Established NRL powerhouses such as the Sydney Roosters – who had qualified for three consecutive Grand Finals from 2002 to 2004 – and defending Premiers the Bulldogs failed to qualify for the finals series. 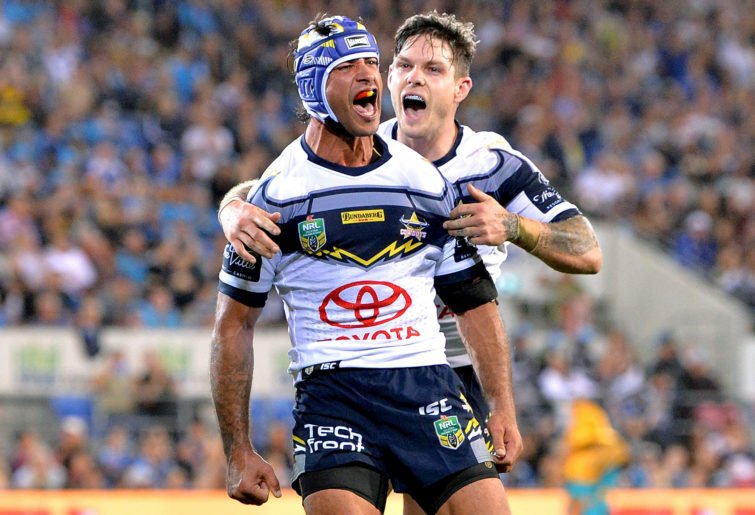 In their place were the North Queensland Cowboys and Wests Tigers, teams who played an exciting brand of football and were not afraid to chance their arm. The uprising of these clubs, who had only two seasons earlier not even been in the conversation come finals time, was a breath of fresh air in the NRL, and proved the unpredictability of the competition. 2005 was also a year in which we were introduced to, or became more familiar with, a number of future superstars who would become the faces of the game going forward. At the top of the heap, which included Benji Marshall, Sonny Bill Williams and Greg Inglis, was Johnathan Thurston. Having only played a handful of games for the Bulldogs during his two-year stint with the club, Thurston made his debut for the North Queensland Cowboys in 2005, where he would remain for the remainder of his career. The move paid dividends almost immediately, as Thurston made his State of Origin debut for Queensland and won his first Dally M Medal. You’d have a difficult time trying to find a more viable candidate for the best new signing. Yep, Australia had them, and New Zealand beat them. The New Zealand Kiwis achieved a feat that had – on paper – appeared unthinkable, as they won the end of season Tri-Nations tournament and established themselves as a threat to the Kangaroos’ dominance at international level. Coached by Wayne Bennett, Australia undoubtedly went into the tournament with the mindset of ‘by how much’ would they win, not even entertaining the thought of defeat. The Kiwis’ defeat of Australia in the opening game, followed by their 24-0 shutout in the Final, was an indicator of what was to come as they slowly continued their ascent over the next few seasons, culminating in their victory at the 2008 World Cup. Of course, the aforementioned reasons are just a few I have chosen to include, but they are enough to illustrate that when it comes to pivotal, as well as memorable, years in rugby league history, 2005 had a lot going for it. Do you have any memories of the 2005 season? Or is there another year which warrants inclusion in the ‘greatest of all time’ conversation? Let me know in the comments below. Until then, I’m off to watch that 2005 Highlights DVD for the umpteenth time.